Rob Ford, presenting himself as the accountable and ethical conservative choice, has a bit of a scandal on his hands. He's peddled himself at an event he did not support and now is being called on the carpet when he's thrown those folks who rallied with him under the bus. As Torontoist points out, Rob Ford set up shop and canvassed for votes as mayor to a group looking to save some green space in Etobicoke. At least not to my surprise, Mr. Ford voted against the motion to ultimately save the green space, despite his presence at an event in its support. In mid-April, [Torontoist] attended the [West Kingsway Ratepayers’ Association]'s "Save the Greenspace" rally at Fairfield Park, and while Ford wasn’t able to make the festivities, he did send a contingent of his campaign workers to cook hot dogs, pose for photos, and distribute "Ford for Mayor" bumper stickers, which gave the impression that he supported the cause. "I was surprised by councillor Ford's lone dissenting vote," [Ward 5 Etobicoke-Lakeshore Councillor Peter] Milczyn told us. "At the public rally...councillor Ford's supporters were present expressing his support for the local community." 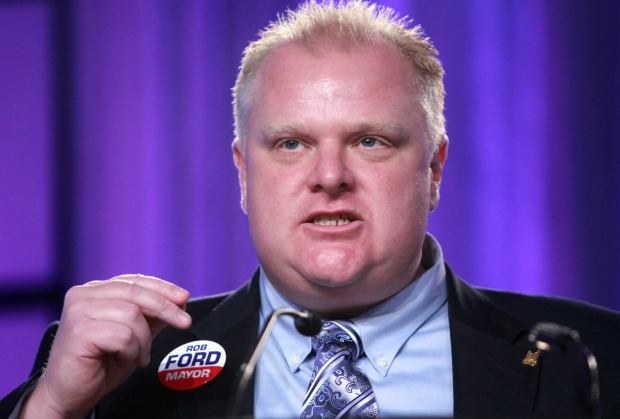 Clearly, Rob Ford represents the politics-as-usual mentality he so decries in Toronto council. He has no intention of changing council mentality. I spoke with Rob Ford on the phone regarding his no vote to save the park and also his sending his people to give out bumper stickers all the while having no intention to vote for it. His response was very unpleasant. He told me he sends people everywhere and that I should walk a mile in his shoes. Also, since I didn't support him that I was wasting his time!I asked for an apology for taking advantage of a volunteer association and he refused. He called again the next day not realizing we had just spoken and simply hung up when I told we had already spoken.